The Python package fluidfft provides a common Python API for performing Fast Fourier Transforms (FFT) in sequential, in parallel and on GPU with different FFT libraries (FFTW, P3DFFT, PFFT, cuFFT). fluidfft is a comprehensive FFT framework which allows Python users to easily and efficiently perform FFT and the associated tasks, such as computing linear operators and energy spectra. We describe the architecture of the package composed of C++ and Cython FFT classes, Python “operator” classes and Pythran functions. The package supplies utilities to easily test itself and benchmark the different FFT solutions for a particular case and on a particular machine. We present a performance scaling analysis on three different computing clusters and a microbenchmark showing that fluidfft is an interesting solution to write efficient Python applications using FFT. Funding statement: This project has indirectly benefited from funding from the foundation Simone et Cino Del Duca de l’Institut de France, the European Research Council (ERC) under the European Union’s Horizon 2020 research and innovation program (grant agreement No 647018-WATU and Euhit consortium) and the Swedish Research Council (Vetenskapsrådet): 2013–5191. We have also been able to use supercomputers of CIMENT/GRICAD, CINES/GENCI (grant 2018-A0040107567) and the Swedish National Infrastructure for Computing (SNIC). Fast Fourier Transform (FFT) is a class of algorithms used to calculate the discrete Fourier transform, which traces back its origin to the groundbreaking work by . Ever since then, FFT as a computational tool has been applied in multiple facets of science and technology, including digital signal processing, image compression, spectroscopy, numerical simulations and scientific computing in general. There are many good libraries to perform FFT, in particular the de-facto standard FFTW . A challenge is to efficiently scale FFT on clusters with the memory distributed over a large number of cores using Message Passing Interface (MPI). This is imperative to solve big problems faster and when the arrays do not fit in the memory of single computational node. A problem is that for one-dimensional FFT, all the data have to be located in the memory of the process that perform the FFT, so a lot of communications between processes are needed for 2D and 3D FFT. To elaborate, there is only one way to apply domain decomposition for 2D FFT, which is to split them into narrow strips across one dimension. However for 3D FFT, there are two strategies to distribute an array in the memory, the 1D (or slab) decomposition and the 2D (or pencil) decomposition. The 1D decomposition is more efficient when only few processes are used but suffers from an important limitation in terms of number of MPI processes that can be used. Utilizing 2D decomposition overcomes this limitation. Some of the well-known libraries are written in C, C++ and Fortran. The classical FFTW library supports MPI using 1D decomposition and hybrid parallelism using MPI and OpenMP. Other libraries, now implement the 2D decomposition for FFT over 3D arrays: PFFT , P3DFFT , 2decomp&FFT and so on. These libraries rely on MPI for the communications between processes, are optimized for supercomputers and scales well to hundreds of thousands of cores. However, since there is no common API, it is not simple to write applications that are able to use these libraries and to compare their performances. As a result, developers are met with a hard decision, which is to choose a library before the code is implemented. Apart from CPU-based parallelism, General Purpose computing on Graphical Processing Units (GPGPU) is also gaining traction in scientific computing. Scalable libraries written for GPGPU such as OpenCL and CUDA have emerged, with their own FFT implementations, namely clFFT and cuFFT respectively. – numpy.fft and scipy.fftpack which are essentially C and Fortran extensions for FFTPACK library. – pyFFTW which wraps FFTW library and provides interfaces similar to the numpy.fft and scipy.fftpack implementations. – mkl_fft, which wraps Intel’s MKL library and exposes python interfaces to act as drop-in replacements for numpy.fft and scipy.fftpack. – mpiFFT4py built on top of pyFFTW and numpy.fft; and its successor mpi4py-fft. – pfft-python which provides extensions for PFFT library. – Reikna, a pure python package which depends on PyCUDA and PyOpenCL. – pytorch-fft: provides C extensions for cuFFT, meant to work with PyTorch, a tensor library similar to NumPy. No effort so far to consolidate sequential, MPI and GPGPU based FFT libraries under a single package with similar syntax. Quite complicated even for the simplest use case scenarios. To understand how to use them, a novice user has to, at least, read the FFTW documentation. No benchmarks between libraries and between the Python solutions and solutions based only on a compiled language (as C, C++ or Fortran). Provides just the FFT and inverse FFT functions, no associated mathematical operators. operators for simple tasks (for example, compute the energy or the gradient of a field). In the present article, we shall start by describing the implementation of fluidfft including its design aspects and the code organization. Thereafter, we shall compare the performance of different classes in fluidfft in three computing clusters, and also describe, using microbenchmarks, how a Python function can be optimized to be as fast as a Fortran implementation. Finally, we show how we test and maintain the quality of the code base through continuous integration and mention some possible applications of fluidfft. to support multiple FFT libraries under the same umbrella and expose the interface for both C++ and Python code development. to keep the design of the interfaces as human-centric and easy to use as possible, without sacrificing performance. Both C++ and Python APIs provided by fluidfft currently support linking with FFTW (with and without MPI and OpenMP support enabled), MKL, PFFT, P3DFFT, cuFFT libraries. The classes in fluidfft offers API for performing double-precision1 computation with real-to-complex FFT, complex-to-real inverse FFT, and additional helper functions. Class hierarchy demonstrating object-oriented approach. The sequential classes are shown in red, the CUDA-based classes in magenta and the MPI-based classes in green. The arrows represent inheritance from parent to child class. alloc_array_X: Allocates array to store a physical array with real datatype for the current process. alloc_array_K: Allocates array to store a spectral array with complex datatype for the current process. init_array_X_random: Allocates and initializes a physical array with random values. test: Run tests for a class by comparing mean and mean energy values in an array before and after a set of fft and ifft calls. bench: Benchmark the fft and ifft methods for certain number of iterations. are_parameters_bad: Verifies whether the global array shape can be decomposed with the number of MPI processes available or not. If the parameters are compatible, the method returns false. This method is called prior to initializing the class. fft and ifft: Forward and inverse FFT methods. Let us illustrate with a trivial example, wherein we initialize the FFT with a random physical array, and perform a set of fft and ifft operations. Similar to other packages in the FluidDyn project, fluidfft also uses an object-oriented approach, providing FFT classes. This is in contrast with the approach adopted by numpy.fft and scipy.fftpack which provides functions instead, with which the user has to figure out the procedure to design the input values and to use the return values, from the documentation. In fluidfft, the Python API wraps all the functionalities of its C++ counterpart and offers a richer experience through an accompanying operator class. where kx, ky represent the wavenumber corresponding to x and y directions, and k is the wavenumber vector. Thus, we have demonstrated how, by using fluidfft, a developer can easily switch between FFT libraries. Let us now turn our attention to how the code is organized. We shall also describe how the source code is built, and linked with the supported libraries. The internal architecture of fluidfft can be visualized as layers. Through Figure 2, we can see how these layers are linked together forming the API for C++ and Python development. For simplicity, only one FFT class is depicted in the figure, namely FFT2DMPIWithFFTWMPI2D, which wraps FFTW’s parallelized 2D FFT implementation. The C++ API is accessed by importing the appropriate header file and building the user code with a Makefile, an example of which is available in the documentation. 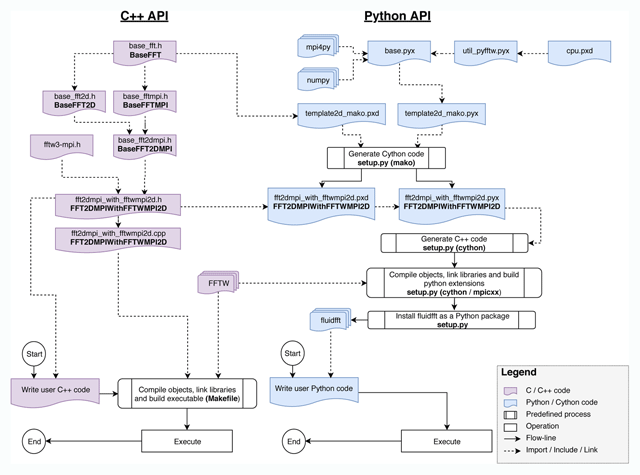 Flowchart illustrating how the C++ and Python API are built and used for one particular class, viz. FFT2DMPIWithFFTWMPI2D. The dotted arrows in C++ part stand for include statements, demonstrating the class hierarchy and in the Python part indicate how different codes are imported. On the bottom, a smaller flowchart demonstrates how to use the API by writing user code. The Python API is built automatically when fluidfft is installed.5 It first generates the Cython source code as a pair of .pyx and .pxd files containing a class wrapping its C++ counterpart.6 The Cython files are produced from template files (specialized for the 2D and 3D cases) using the template library mako. Thereafter, Cython  generates C++ code with necessary Python bindings, which are then built in the form of extensions or dynamic libraries importable in Python code. All the built extensions are then installed as a Python package named fluidfft. A helper function fluidfft.import_fft_class is provided with the package to simply import the FFT class. However, it is more convenient and recommended to use an operator class, as described in the example for Python API. Although the operator classes can function as pure Python code, some of its critical methods can be compiled, if Pythran  is available during installation of fluidfft. We will show towards the end of this section that by using Pythran, we reach the performance of the equivalent Fortran code. One C++ class per FFT library derived from a hierarchy of C++ classes as shown in Figure 1. Cython wrappers of the C++ classes with their unit test cases. Python operator classes (2D and 3D) to write code independently of the library used for the computation of the FFT and with some mathematical helper methods. These classes are accompanied by unit test cases. Pythran functions to speedup critical methods in the Python operator classes. Command-line utilities (fluidfft-bench and fluidfft-bench-analysis) are also provided with the fluidfft installation to run benchmarks and plot the results. In the next subsection, we shall look at some results by making use of these utilities on three computing clusters. where np,min is the minimum number of processes employed for a specific array size and hardware. The subscripts, α denotes the FFT class used and “fastest” corresponds to the fastest result among various FFT classes. fft_cpp,ifft_cpp (continuous lines): benchmark of the C++ function from the C++ code. An array is passed as an argument to store the result. No memory allocation is performed inside these functions. fft_as_arg,ifft_as_arg (dashed lines): benchmark of a Python method from Python. Similar to the C++ code, the second argument of this method is an array to contain the result of the transform, so no memory allocation is needed. fft_return,ifft_return (dotted lines): benchmark of a Python method from Python. No array is provided to the function to contain the result, and therefore a numpy array is created and then returned by the function. Hereafter, for the sake of brevity, the FFT classes will be named in terms of the associated library (For example, the class FFT3DMPIWithFFTW1D is named fftw1d). Let us go through the results8 plotted using fluidfft-bench-analysis. Benchmarks on OccigenOccigen is a GENCI-CINES HPC cluster which uses Intel Xeon CPU E5–2690 v3 (2.6 GHz) processors with 24 cores per node. The installation was performed using Intel C++ 17.2 compiler, Python 3.6.5, and Open-MPI 2.0.2. Figure 3 demonstrates the strong scaling performance of a cuboid array sized 384 × 1152 × 1152. This case is particularly interesting since for FFT classes implementing 1D domain decomposition (fftw1d and fftwmpi3d), the processes are spread on the first index for the physical input array. This restriction is as a result of some FFTW library internals and design choices adopted in fluidfft. This limits fftw1d (our own MPI implementation using MPI types and 1D transforms from FFTW) to 192 cores and fftwmpi3d to 384 cores. The latter can utilize more cores since it is capable of working with empty arrays, while sharing some of the computational load. The fastest methods for relatively low and high number of processes are fftw1d and p3dfft respectively for the present case. Speedup computed from the median of the elapsed times for 3D fft (384 × 1152 × 1152, left: fft and right: ifft) on Occigen. The benchmark is not sufficiently accurate to measure the cost of calling the functions from Python (difference between continuous and dashed lines, i.e. between pure C++ and the as_arg Python method) and even the creation of the numpy array (difference between the dashed and the dotted line, i.e. between the as_arg and the return Python methods). Figure 4 demonstrates the strong scaling performance of a cubical array sized 1152 × 1152 × 1152. For this resolution as well, fftw1d is the fastest method when using only few cores and it can not be used for more that 192 cores. The faster library when using more cores is also p3dfft. This also shows that fluidfft can effectively scale for over 10,000 cores with a significant increase in speedup. Speedup computed from the median of the elapsed times for 3D fft (1152 × 1152 × 1152, left: fft and right: ifft) on Occigen. Benchmarks on BeskowBeskow is a Cray machine maintained by SNIC at PDC, Stockholm. It runs on Intel Xeon CPU E5-2695 v4 (2.1 GHz) processors with 36 cores per node. The installation was done using Intel C++ 18 compiler, Python 3.6.5 and CRAY-MPICH 7.0.4. In Figure 5, the strong scaling results of the cuboid array can be observed. In this set of results we have also included intra-node scaling, wherein there is no latency introduced due to typically slower node-to-node communication. The fastest library for very low (below 16) and very high (above 384) number of processes in this configuration is p3dfft. For moderately high number of processes (16 and above) the fastest library is fftwmpi3d. Here too, we notice that fftw1d is limited to 192 cores and fftwmpi3d to 384 cores, for reasons mentioned earlier. Speedup computed from the median of the elapsed times for 3D fft (384 × 1152 × 1152, left: fft and right: ifft) on Beskow. A striking difference when compared with Figure 3 is that fftw1d is not the fastest of the four classes in this machine. One can only speculate that this could be a consequence of the differences in MPI library and hardware which has been employed. This also emphasises the need to perform benchmarks when using an entirely new configuration. The strong scaling results of the cubical array on Beskow are displayed on Figure 6, wherein we restrict to inter-node computation. We observe that the fastest method for low number of processes is again, fftwmpi3d. When high number of processes (above 1000) are utilized, initially p3dfft is the faster methods as before, but with 3000 and above processes, pfft is comparable in speed and sometimes faster. Speedup computed from the median of the elapsed times for 3D fft (1152 × 1152 × 1152, left: fft and right: ifft) on Beskow. Benchmarks on a LEGI cluster Let us also analyse how fluidfft scales on a computing cluster maintained at an institutional level, named Cluster8 at LEGI, Grenoble. This cluster functions using Intel Xeon CPU E5-2650 v3 (2.3 GHz) with 20 cores per node and fluidfft was installed using a toolchain which comprises of gcc 4.9.2, Python 3.6.4 and OpenMPI 1.6.5 as key software components. In Figure 7 we observe that the strong scaling for an array shape of 320 × 640 × 640 is not far from the ideal linear trend. The fastest library is fftwmpi3d for this case. As expected from FFT algorithms, there is a slight drop in speedup when the array size is not exactly divisible by the number of processes, i.e. with 12 processes. The speedup declines rapidly when more than one node is employed (above 20 processes). This effect can be attributed to the latency introduced by inter-node communications, a hardware limitation of this cluster (10 Gb/s). Speedup computed from the median of the elapsed times for 3D fft (320 × 640 × 640) at LEGI on cluster8. We have also analysed the performance of 2D MPI enabled FFT classes on the same machine using an array shaped 2160 × 2160 in Figure 8. The fastest library is fftwmpi2d. Both fftw1d and fftwmpi2d libraries display near-linear scaling, except when more than one node is used and the performance tapers off. Speedup computed from the median of the elapsed times for 2D fft (2160 × 2160) at LEGI on cluster8. As a conclusive remark on scalability, a general rule of thumb should be to use 1D domain decomposition when only very few processors are employed. For massive parallelization, 2D decomposition is required to achieve good speedup without being limited by the number of processors at disposal. We have thus shown that overall performance of the libraries interfaced by fluidfft are quite good, and there is no noticeable drop in speedup when the Python API is used. This benchmark analysis also shows that the fastest FFT implementation depends on the size of the arrays and on the hardware. Therefore, an application build upon fluidfft can be efficient for different sizes and machines. Note that, this implementation is “out-of-place”, meaning that the result is returned by the function and that the input velocity field (vx, vy, vz) is unmodified. The comment above the function definition is a Pythran annotation, which serves as a type-hint for the variables used within the functions — all arguments being Numpy arrays in this case. Pythran needs such annotation to be able to compile this code into efficient machine instructions via a C++ code. Without Pythran the annotation has no effect, and of course, the function defaults to using Python with Numpy to execute. The array notation is well adapted and less verbose to express this simple vector calculus. Since explicit loops with indexing is not required, the computation with Python and Numpy is not extremely slow. Despite this being quite a favourable case for Numpy, the computation with Numpy is not optimized because, internally, it involves many loops (one per arithmetic operator) and creation of temporary arrays. Elapsed time (smaller is better) for the projection function for different implementations and tools. The shape of the arrays is (128, 128, 65). The dotted lines indicate the times for Fortran for better comparison. a Fortran code (not shown)9 written with three nested explicit loops (one per dimension). Note that as in the Python version we also allocate the memory where the result is stored. the simplest Python version shown above. For the version without explicit loops, we present the elapsed time for two cases: (i) simply using Python (yellow bar) and (ii) using the Pythranized function (first cyan bar). For the Python version with explicit loops, we only present the results for (i) the Pythranized function (second cyan bar) and (ii) the result of Numba (blue bar). We do not show the result for Numba for the code without explicit loops because it is slower than Numpy. We have also omitted the result for Numpy for the code with explicit loops because it is very inefficient. The timing is performed upon tuning the computer using the package perf. We see that Numpy is approximately three time slower than the Fortran implementation (which as already mentioned contains the memory allocation). Just using Pythran without changing the code (first cyan bar), we save nearly 50% of the execution time but we are still significantly slower than the Fortran implementation. We reach the Fortran performance (even slightly faster) only by using Pythran with the code with explicit loops. With this code, Numba is nearly as fast (but still slower) without requiring any type annotation. Note that this code is much longer and clearly less readable than the version without explicit loops. This is however the version which is used in fluidfft since it leads to faster execution. The elapsed time for these in-place versions and for an equivalent Fortran implementation are displayed in the bottom axis of Figure 9. The ranking is the same as for the out-of-place versions and Pythran is also the faster solution. However, Numpy is even more slower (7.8 times slower than Pythran with the explicit loops) than for the out-of-place versions. Memory allocation takes time! In Python, memory management is automatic and we tend to forget it. An important rule to write efficient code is to reuse the buffers already allocated as much as possible. Even for this very simple case quite favorable for Numpy (no indexing or slicing), Numpy is three to eight time slower than the Fortran implementations. As long as the execution time is small or that the function represents a small part of the total execution time, this is not an issue. However, in other cases, Python-Numpy users need to consider other solutions. Pythran is able to speedup the Numpy code without explicit loops and is as fast as Fortran (even slightly faster in our case) for the codes with explicit loops. Numba is unable to speedup the Numpy code. It gives very interesting performance for the version with explicit loops without any type annotation but the result is significantly slower than with Pythran and Fortran. The package fluidfft currently supplies unit tests covering 90% of its code. These unit tests are run regularly through continuous integration on Travis CI with the most recent releases of fluidfft’s dependencies and on Bitbucket Pipelines inside a static Docker container. The tests are run using standard Python interpreter with all supported versions. For fluidfft, the code coverage results are displayed at Codecov. Using third-party packages coverage and tox, it is straightforward to bootstrap the installation with dependencies, test with multiple Python versions and combine the code coverage report, ready for upload. It is also possible to run similar isolated tests using tox or coverage analysis using coverage in a local machine. Up-to-date build status and coverage status are displayed on the landing page of the Bitbucket repository. Instructions on how to run unit tests, coverage and lint tests are included in the documentation. We also try to follow a consistent code style as recommended by PEP (Python enhancement proposals) 8 and 257. This is also inspected using lint checkers such as flake8 and pylint among the developers. The Python code is regularly cleaned up using the code formatter black. Windows and any POSIX based OS, such as GNU/Linux and macOS. Python 2.7, 3.5 or above. For the next versions, we will drop Python 2.7 support and Python >= 3.6 will be required. Note that while Cython and Pythran both use the C API of CPython, fluidfft has been successfully tested on PyPy 6.0. A C++11 supporting compiler, while not mandatory for the C++ API or Cython extensions of fluidfft, is recommended to be able to use Pythran extensions. Optional: OpenMPI or equivalent, FFTW, P3DFFT, PFFT and cuFFT libraries. Minimum: fluiddyn, Numpy, Cython, and mako or Jinja2; FFTW library. Optional: mpi4py and Pythran; P3DFFT, PFFT and cuFFT libraries. Pierre Augier (LEGI): creator of the FluidDyn project  and of fluidfft. Cyrille Bonamy (LEGI): C++ code and some methods in the operator classes. Ashwin Vishnu Mohanan (KTH): command lines utilities, benchmarks, unit tests, continuous integration, and bug fixes. Licence: CeCILL, a free software license adapted to both international and French legal matters, in the spirit of and retaining compatibility with the GNU General Public License (GPL). Licence: CeCILL-B, a BSD compatible French licence. fluidfft is used by the Computational Fluid Mechanics framework fluidsim . It could be used by any C++ or Python project where real-to-complex 2D or 3D FFTs are performed. 1Most C++ classes also support single-precision. 5Detailed steps for installation are provided in the documentation. 6Uses an approach similar to guidelines “Using C++ in Cython” in the Cython documentation. 7Detailed discussion on “FFT 3D parallel (MPI): Domain decomposition” tutorial. 9The codes and a Makefile used for this benchmark study are available in the repository of the article. 10Here, we use Python 3.6.4 (packaged by conda-forge), Numpy 1.13.3, Pythran 0.8.5, Numba 0.38, gfortran 6.3 and clang 6.0. 11The results with g++ -03 -march=native are very similar but tend to be slightly slower. Ashwin Vishnu Mohanan could not have been as involved in this project without the kindness of Erik Lindborg. We are grateful to Bitbucket for providing us with a high quality forge compatible with Mercurial, free of cost. Augier, P, Mohanan, A V and Bonamy, C 2019 ‘FluidDyn: A python open-source framework for research and teaching in fluid dynamics by simulations, experiments and data processing’. J. Open Research Software (DOI). Mohanan, A V, Bonamy, C and Augier, P 2019 ‘FluidSim: Modular, object-oriented python package for high-performance CFD simulations’. J. Open Research Software (DOI).